Enjoy the ultimate cruise experience with a contemporary twist aboard Carnival Sunshine. 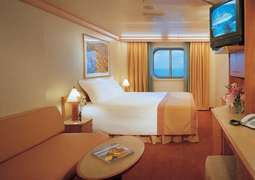 Its cozy staterooms and friendly service will impress even the most experienced of travelers, and make for a relaxing tropical getaway with unparalleled comfort and luxury. Carnival Sunshine is perfect for families with kids. There are special activities for kids and teens and endless entertainment options for adults. 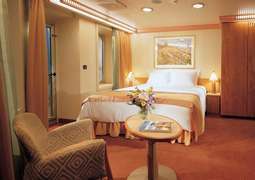 The cruise ship is full of amazing dining choices, from the offerings at the main dining rooms, the Galaxy and the Universe, to the Lido Marketplace buffet. Staterooms on Carnival Sunshine are designed for maximum comfort in mind. 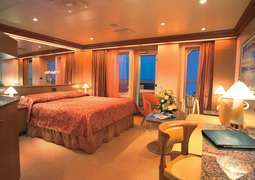 Carnival Sunshine offers four accommodation options: interior, balcony, and oceanview staterooms, and suites. 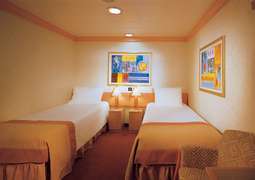 Carnival Cruise Line's staterooms are roomy and comfortable, ranging between 185 and 220 square feet. If you’re looking for more space, the oceanview staterooms are an ideal option, covering up to 265 square feet with a spacious balcony. Suites, the largest choices, are 500 square feet and can accommodate up to five people. Carnival Sunshine offers a wide range of fine dining options, including Guy's Burger Joint, BlueIguana Cantina, Cucina Del Capitano, and JiJi Asian Kitchen. The Lido Marketplace buffet is a popular joint, offering a variety of choices for breakfast, lunch, and dinner. Steakhouse Fahrenheit 555 serves seafood and beef delicacies that will make your mouth water. The Taste Bar is the ideal spot to try a delicious appetizer before dinner, and you can enjoy popular Asian delights at Mongolian Wok. For families, there are a plethora of entertainment activities all day long for various age groups. Kids can have plenty of fun at Camp Carnival, where they can make their own pizza, swing on ropes, play basketball, or play miniature golf. Carnival Sunshine is a paradise for health enthusiasts. From exotic beauty treatments to rejuvenating wellness programs, the activities on board will surely keep you in shape. Find yourself surrounded by tranquility at the Serenity Adult Retreat, or experience relaxing spa treatments at the Cloud 9 Spa. During the day, casual wear is standard. For ladies, casual dress includes shorts, tank tops, and sundresses; for men, shorts, T-shirts, and polo shirts are recommended. During the evening, the dress code is cruise casual, which comprise khakis, a nice pair of jeans, and a polo or sports shirt for men, and casual skirts, pants and blouses, summer Capri pants, dresses, and dress shorts for ladies. During cruise elegant nights, a tuxedo, sport coat, dress shirt, or business suit is appropriate for men, and for ladies, smart cocktail attire, skirts, blouses, pantsuits, and evening gowns are preferred.